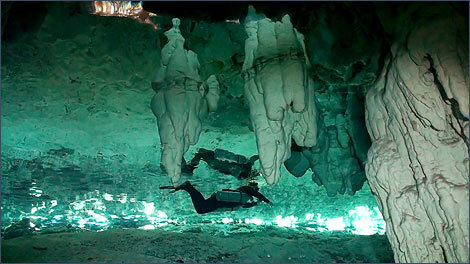 Access is via the Dos Ojos entrance located 1km south of Xel Ha on Highway 307. From the turnoff a 3km dirt road leads out to Dos Ojos and Pet Cemetery is a further 20 minute drive into the jungle over quite a rough trail from there. Demanding - very shallow and the line is sometimes in the middle of formations. Good buoyancy control is a must.